Why does Minecraft grass have different colors, and how can I make it bright colored? As you can see the left and right parts are bright but the middle part is pale. Why is it like that? Grass is different colours in different biomes, and you're seeing the "dry desert" grass colour in the middle of your screenshot. The difference in colours is controlled by one texture file though, so it's easy enough to fix by installing a resource/texture pack that changes that file to be one uniform green instead of a gradient of greens and yellows. If you want a different green than the one I picked and have some facility with zip-file creation and image editing software, you can find the one texture file it contains and change the triangle of green to a green more to your liking. Grass color is based on biome. The grass in the middle is in a desert biome. You can't really control this without just picking another spot (I guess if you really wanted to you could change the biome with MCEdit). Jungle biomes have the brightest green grass, forest and plains biomes also have fairly green grass. Pretty much any biome except the particularly arid ones will have grass like the grass surrounding the brown grass in your screenshot (with the exception of swamp biomes, which features really dark green grass). 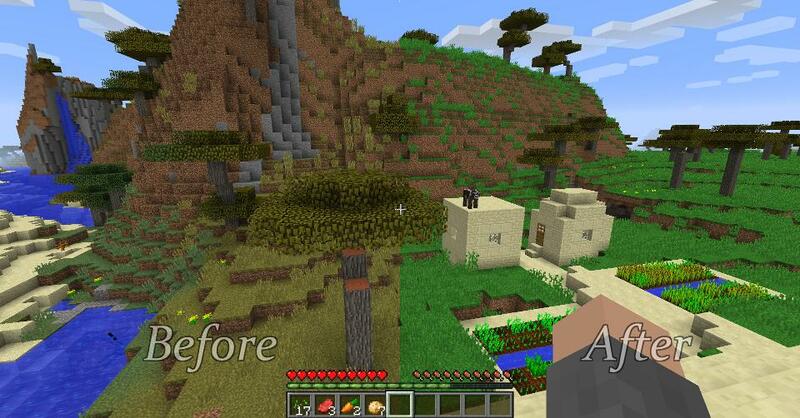 Basically, if you don't like the color of the grass, go find a biome where there is grass shade you like. The jungle has the brightest shade, if my memory does not deceive me. That's the best help I can offer. If you don't want to deal with all the jungle trees, a plains biome is a nice shade too. Can I disable different colored grass? How can you make Minecraft look like it did back in the Alpha stages? Why does Minecraft get stuck downloading 'guava-17.0.jar'? Why isn't my tellraw command working? How can I make a piston block swapper that isn't flush with a wall?